Feb. 9  A series of atom-smashing experiments in Switzerland may have created the same form of matter that filled the universe for the first moment of its existence. In the first 1/100,000th of a second after the Big Bang that give birth to the universe, temperatures were so hot that fundamental particles known as quarks floated around individually. Scientists at CERN say a series of experiments slamming iron ions together provide strong evidence that they have recreated this primordial state of matter. 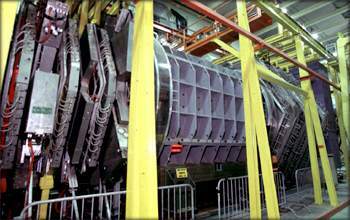 Even if confirmed by future experiments, the seven CERN experiments, which began in 1994, wont offer any immediate practical benefits. But they would be a breakthrough for scientists trying to go back to study the earliest moments of the creation of the universe, enabling them to take a step in studying particles and forces as yet unobserved. An atom consists of a cloud of electrons surrounding a nucleus of protons and neutrons. Each proton and neutron, in turn, consists of three smaller quarks bound together by other particles known as gluons. Think of the quarks as little balls, and the gluons as rubber bands holding them tightly together. Scientists have deduced the existence of quarks through numerous experiments, but have never seen them directly. In the CERN experiments, a beam of lead ions was slammed into stationary targets, creating temperatures hotter than 2 trillion degrees Fahrenheit, or more than 100,000 times hotter than the center of the sun. The violent collisions created matter so hot and dense that the gluon bindings loosened, allowing individual quarks to swim free for a moment. More conclusive evidence of this state of matter, called a quark-gluon plasma will await the new Relativistic Heavy Ion Collider at Brookhaven National Laboratory on New Yorks Long Island, set to begin collecting data this summer with collisions 10 times more energetic. Scientists have long expected to find this super-hot primordial soup as part of the theory that the universe was created in a gigantic explosion. 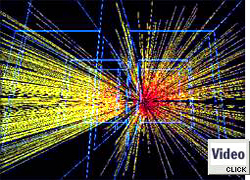 But 1/100,000th of a second after the Big Bang, matter cooled enough for the gluons to pull the quarks together into protons and neutrons, eliminating free quarks from the universe. Up till now, scientists accelerators were too weak to break apart the quarks. Its very good news for the Relativistic Heavy Ion Collider, because they will be able to make it very easily and study it in great detail, Gillies said. He noted that many of the scientists who have been working at CERN will also work at Brookhaven  and return to Geneva in 2005 when CERN will have an even more powerful accelerator. Although some have expressed concerns that recreating the Big Bang could have cataclysmic side effects  such as the creation of matter-swallowing black holes  most physicists say there is no danger. Such high-energy collisions, they say, occur frequently in nature, including high-energy cosmic rays slamming into the moon and the Earths atmosphere, without any world-ending consequences.